Hallmark of Harmony is the male barbershop chorus of the Sheffield Barbershop Harmony Club, based in Sheffield, England. The chorus formed in 1978 and has won the British Association of Barbershop Singers (BABS) gold medal seven times, in 1986, 1989, 1991, 1994, 1997, 2000 and 2014. It won the silver medal in 1983, 1984, 1988, 1993, 1996, 1999 and 2013 & bronze in 1985 and 2012. 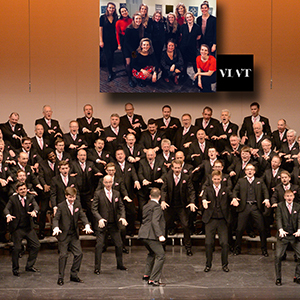 As BABS Chorus Champions for 2014, Hallmark of Harmony qualified to represent the country in the Barbershop Harmony Society International Chorus Contest in Pittsburgh, PA in July 2015. They did so, taking a chorus of some 60+ members, and achieved an A-level score and a place of 19th in the world. This was their fourth trip to the contest. The group’s name comes from Sheffield’s long tradition of silversmithing, where a hallmark was used to identify the silversmith, the grade of metal and the date of creation of items.